Tripp Lite's Medical-Grade Mobile Power Retrofit Kit provides UL 60601-1 compliance (a required patient shock-prevention measure) for all connected mobile electronic devices. The Mobile Power Retrofit Kit includes everything needed to add AC power to medical carts. 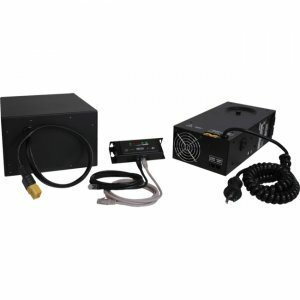 The kit's power supply features an isolation transformer that reduces the cumulative shock potential of connected equipment, helping to ensure UL 60601-1 compliance. The included 90 amp-hour battery module provides long-lasting mobile power. Included PowerAlert Software saves valuable patient data from loss or corruption if the cart is left unattended and battery power is depleted. The Mobile Power Retrofit Kit also includes a remote user interface (RUI), mounting hardware and standard cabling.Tripp Lite's Medical-Grade Mobile Power Retrofit Kit is fully compatible with most popular carts by AFC, Anthro, Datalux, GCX, Hergo, Humanscale, Jaco, Knurr, Stinger and more.